Our stump grinding services are the best and most affordable method to handle your unwanted stumps. In the NEW JERSEY and TRI-STATE AREA. 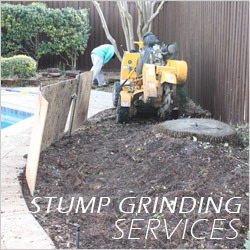 An average stump grinding service grinds approximately 6-8 in. below ground level. This is the best approach for a stump if the only consideration of the area is to let grass grow over. In addition to grinding the stump, we also grind the root flares that are exposed throughout the tree stump. We also offer stump removal services. Our machines have the ability to remove tree stumps in order to allow for a new tree to be planted in the same area. Our employees have done numerous amounts of stump removals for nurseries, contractors and homeowners to allow the use of the same area for a new tree. We have the proper equipment to get your stump service needs done right, the first time. Our lightweight machines fit through standard 36" inch gates, making it easy to get to backyard tree stumps and because our machines are lightweight, there is very little to no damage to your grass. After our stump services have been completed, we use the compost mulch to level the ground. The compost produced from your old tree can also be used as mulch for your flowerbed or it can be hauled away by our employees.